Could Vision really have survived Thanos ripping the Mind Stone from his head? A new Avengers: Endgame fan theory believes that he did and that he will ultimately be the key component that helps take down the Mad Titan and saves the decimated superheroes. Now that the Endgame trailer has been released, Marvel Cinematic Universe fans have been diving deep into the source material to see how the dusted characters will return, and this new theory strays away from the time travel theories that have been floating around. The Avengers: Endgame fan theory comes from an MCU fan on Reddit who believes that there is something that we all missed when Vision died at the end of Infinity War. For starters, he actually dies twice, but the new theory predicts that he may have actually survived. When Scarlet Witch destroys the Mind Stone, which causes Vision’s body to explode at the same time, he’s gone. However, when Thanos rips the Stone from his head, his body turns dark gray and slumps to the ground. 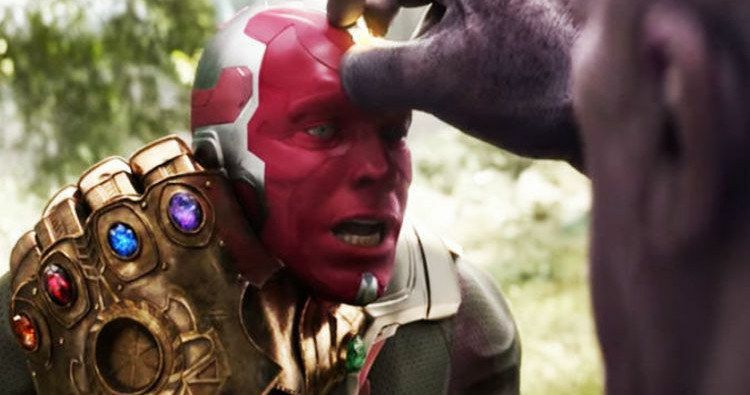 The theory doesn’t think that Vision’s body survived, but instead believes that he was able to transfer his mind into the Mind Stone when the Mad Titan was pulling it from his skull. The theory goes on to predict that Vision has been subconsciously influencing Thanos and that the dusted heroes could be alive, possibly in the Soul Stone or in an alternate universe. While this is all pretty farfetched, it isn’t exactly unprecedented in the Infinity Gauntlet comic series, which is what Infinity War and Avengers: Endgame are loosely based on. In the original comics, Thanos had his mind tampered with by Adam Warlock, who is not included in Infinity War and more than likely will not be featured in Avengers: Endgame either. So, if the Russo Brothers did decide to go down this path, Vision would be one of the better options for taking on the job. Additionally, the groundwork has already been set in the previous movie, hinting that Vision has become something much different from what he was before. In Infinity War, Bruce Banner is looking over Vision’s diagnostics on Wakanda when Shuri is trying to figure out a way to safely remove the Mind Stone from his head. Banner goes on to explain that he believes Vision is part Mind Stone, part Ultron, part Tony Stark, part J.A.R.V.I.S., and possibly something else, which could be even more powerful, allowing him to possibly live without the Mind Stone. If this theory proves to be true, it would make sense that Vision was able to transfer everything that he is into the Mind Stone after Banner’s observations. This theory is refreshing in that it doesn’t involve the time travel aspect, though that doesn’t really mean much since this is all speculation. You can head over to Reddit to read the original Avengers: Endgame theory.